Four chili pepper plants are in the garden. The fruit ripens individually over the Summer and they are picked and placed in the greenhouse to further dry. The stem end is cut off and they are further dried in the dehydrator. When completely dry they are beat into a powder in the blender. 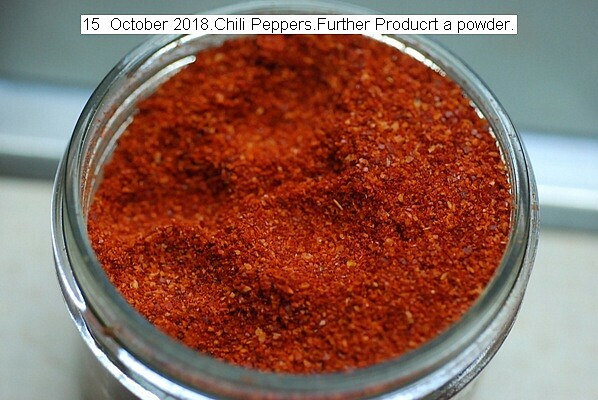 The powder is used as a table condiment as required. The heat never leaves and the powder is as hot in two years as it is today. The powder is kept in a mason jar in the cupboard. Final processing a fine homogeneous powder about 120 grams. 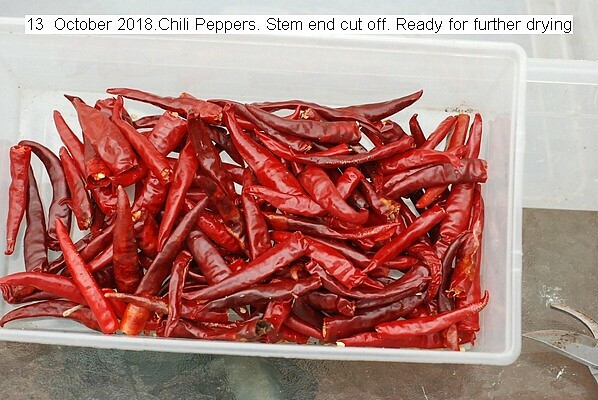 This entry was posted in Uncategorized and tagged 13 October 2018 Chili Peppers, 13 October 2018 Drying Chili Peppers. Bookmark the permalink.